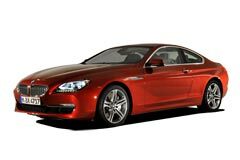 BMW 6 Series - Car Reliability Search | Reliability Index | How reliable is your car? Reliability Index 160.00 What does this mean? Average Age 6 yrs What does this mean? Average Mileage 56,218 miles What does this mean? Time Off The Road (avg) 2.76 hrs What does this mean? Average Repair Costs £543.19 What does this mean? Axle & Suspension 12.58% What does this mean? Braking System 1.26% What does this mean? Cooling & heating system 13.21% What does this mean? Electrical 32.08% What does this mean? Engine 25.16% What does this mean? Fuel System 8.18% What does this mean? Gearbox 1.89% What does this mean? Steering System 3.14% What does this mean? Transmission 0.63% What does this mean?